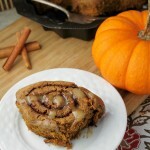 Gluten free pumpkin cinnamon rolls. Oh yes…they happened! Full with nutrient dense ingredients, and a lovely chewy texture, these cinnamon roll are a breakfast treat! Even better, they have no eggs, so even MORE people can enjoy them! A gluten free, egg free, and dairy free cinnamon roll the whole family can enjoy, and mom can feel good about serving!! Free of the top 8 allergens, one would wonder how anything so delicious and wholesome could exist: but they do and it IS possible! A beautiful thing about gluten free cinnamon rolls is that there is no double rising or kneading as in gluten-filled yeasted breads…so having these for breakfast in a timely manner without making them ahead of time is actually possible! You could also make the rolls (without letting them rise) the night before, cover them and store them in the fridge for morning rising and baking. These rolls are sure to please a crowd…soft, slightly crunchy on the exterior and bursting with cinnamon flavor. Pour yeast into warm milk and honey (not too hot or you will kill it! You should be able to comfortably leave your finger in the liquid, or 110 degrees). Set aside 10 minutes to get foamy. Combine the wet and dry mixtures and mix to incorporate. Let the dough rest for about 5 minutes, this allows time for the psyllium to do it's magic. If the dough seems overly soft and sticky, add some more flour (the water content of pumpkin purees varies widely). Gather the dough into a ball, and dust all sides with flour. Prepare your rolling station: lay out two non-stick baking mats, or waxed paper, or plastic wrap, or any combo of these. If using plastic wrap, tape the bottom piece down onto the counter. Gently peel the top layer off. Spread your chosen fat over the entire surface. Sprinkle with the palm sugar, and then the cinnamon. Using the bottom mat or paper as an assist, gently lift the mat up, starting to roll the dough. Because the dough is soft, you will have to assist in the rolling process: lift, tuck with fingers and roll. Cut the roll into roughly 1-1 1/4" pieces, about 11-12 rolls. Place the rolls into a greased, round cake pan. You will need to use two pans, and one may not be full. Allow room for rising, meaning do not have the rolls touching each other, just barely apart. When they rise, they will fill in and touch each other plenty! Let rolls rise in a warm place until roughly double in size. Mine took about 30 minutes with regular yeast in a warm (110 degree) oven. Bake in a 350 degree oven for about 30 minutes until turning golden and no doughiness is felt. Hi Tessa, I know this recipe has been up for a while but I have always wanted to try these! However, I need your help: you mention that they could be made the day before and let rise in the morning…. can you direct me further on this re: the yeast? I’m inexperienced at working with yeast so that part confused me. 🙂 I would really like to try these for a holiday breakfast though! Hi Rebekah! 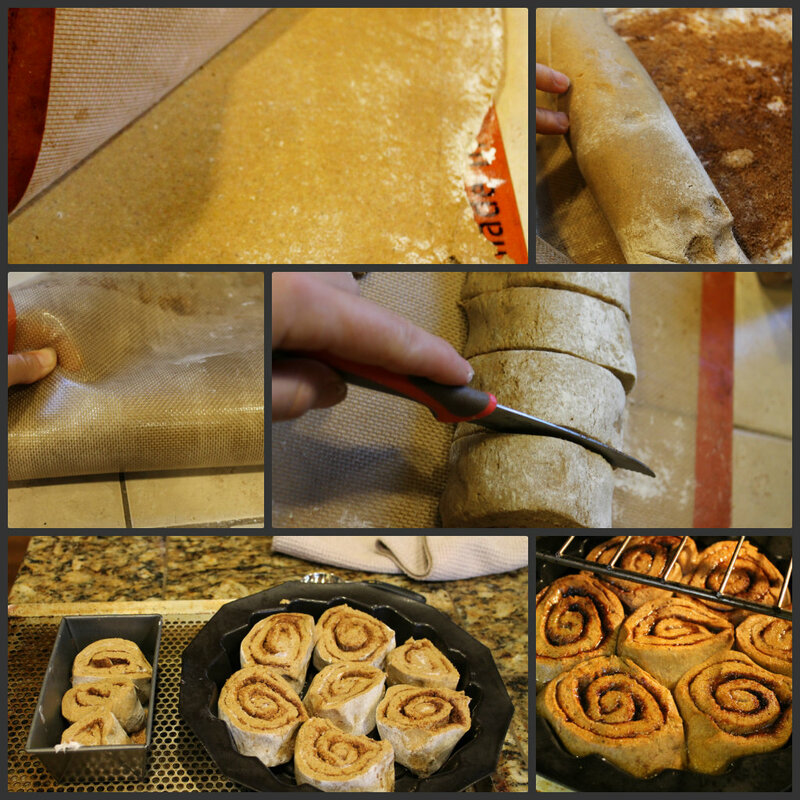 It is super simple…proof the yeast and make the rolls as described. Then cover with plastic wrap, place in fridge. The next morning, you need to bring to room temp and then let rise. I do this in my oven, preheat it for a few minutes,turn off the heat, then place inside with the door closed. If They are super cold, I sometimes heat the oven a second time. Hope that helps! Yay! Thanks Tessa, I will be trying these! I’m excited to make these for Christmas morning! 🙂 Question for you- for the “flours”, can I take whole grains and grind them in my blendtec? For example, I already have oats and millet, and it would be much cheaper to grind them myself than to go buy those flours. I’m just worried that they won’t grind as fine or something? Sorry Amy, this was in my Spam box so didn’t see it until now! Anyways..with the oats, you should be fine…and probably with the millet too…but if you were going to try with teff, don’t bother. I can always help you change the flours to what you already have on hand too, so just let me know! They were delish!! The house smelled wonderful while they baked. I omitted the stevia as I just don’t like it and I knew my husband would want a glaze (ok, so would I). Thank you for all the flour advise! Yay Leah, here to help anytime…what gf all purpose did you use? Thanks for all your help! They were delish! I will be making them again! Lol…I have Sorghum, Oat, Millet, Almond, Tapioca for GF (but I feel like I have more than that!) and then I have Whole wheat and white whole wheat flour. I need a class on GF flours and how to use them apparently! Could you use “all-purpose” GF Flour in place of flours in recipes? Sorry for all the flour questions! Ok Leah, first read my gf baking tips page….it might help get you started on the understanding the different flours route! Yes an all purpose gf mix would work…just know every flour lends a different flavor and texture to the end product. Ultimately, it takes experimenting to figure out what flours suit your tastes…I for example do not like bean flours in my baked goods (but they are great for adding structure to gf goods! And many love them). You could make an all purpose mix with the flours you have too….1 cup each wholegrain flour and 2-3 cups tapioca. You came other add Xanthippe gum or guar gum to each recipe, or add 6-7 teaspoons to the mix (about a 1/2 teaspoon per cup of flour). Ps, it is my pleasure to help you out….it is why I do this blog! Oops- you are right, that was another I was thinking of. So teff flour was the only one I was missing. In my typical style- go big or go home:) I am sure they will be tasty! I am making them Fridy night to bake Saturday morning as part of my 31 days of new pupkin recipes:) Thank you! Try using oat or toasted quinoa, or a mixture of brown rice and oat to replace the teff. Do you have those flours? Or what DO you have on hand? I really want to try this recipe and I can find everything but the coconut and Teff flour. Can I just replace with other flours? I bought Sorgum (sp?) flour to replace the cocunt, but I feel like I just spent a mortgage payment on flour! :) Suggestions? I am not GF but experiementing with the idea nad different types of flours. THANKS and I can’t wait to try this!! And yes…gf flours ARE more expensive, definitely some sticker shock in the beginning! Once you find flours you know you like, you get the price down by buying in bulk. You definitely picked a doozy of a recipe for your first gf attempt! Let me know if you need some help! Hey Tessa! I am thinking about making these for Christmas morning. Eek – I have no yeast in the house. Umm…do you think I could 1/2 the starch? we are trying not to use any……. sure Adrienne..you’ll sacrifice some texture…but it should work fine! Tessa, these look great! Seriously, I think you do everything well! WOW, all of your recipes are just amazing! Keep up the great work! I’m pretty sure I say this every time I comment on one of your recipes, but they always look SO AMAZING. Can’t wait to try this one. Your Pumpkin Cinnamon Rolls sound so delicious with such lovely seasonal flavours. It’s excellent that they are so allergy friendly – what a great recipe! These look delicious Tessa! Thanks for sharing on Natural Living Monday! Holy moly, Tessa! You inspire me again with your amazing recipes! I might just have to make these for tomorrow morning! Thank you Angie, enjoy these! I made Kale chips from your recipe the other day…again ; ) The whole batch is always gone within 5 minutes! I’ve been passing your blog around to several friends who are gluten/dairy free. We are dairy free (most of the time – we still slip up when we go out) and I’d like to try gluten free for a while and see if my oldest behavior changes. She also has problems with rashes on her bottom which I think would also clear up. I’ll be on you blog a lot! Those kale chips certainly are like crack for us too Amber! Going out is always tricky, especially the more tings you are avoiding! How old is you daughter? What sort of behavior are you seeing? Taking gluten out of your diet can change so many things….it’s a learning curve in the beginning, but it’s gets to be just part of your routine. 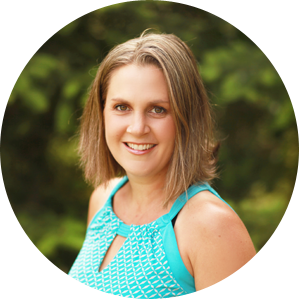 I can;t tell you how many people around me who have tried paleo or gluten free and noticed huge changes in their health…things they didn’t even know were issues until those symptoms were gone! You can do it…and I am here to help! Wowsers, I bet these went over ridiculously well. They look amazing! We loved them…of course! My kids of course look for the frosting first…..kids will be kids France! Doesn’t oat flour contain gluten? I know oats do! Please clarify … Thanks. Looks great, I’d love to try it, but don’t want any gluten. Hi Marna! I take certain things for granted anymore, so thanks for your question! Oats do NOT contain gluten, but are processed in the same facilities on the same machines, so cross contamination is almost inevitable. You want certified gluten free oats…these have been processed in a gluten-clean facility, and these are what I use, gluten free oats and oat flour. It is also worth noting that some people do still have a problem with oats and the protein is similar to wheat’s, even without the gluten…everyone has to find out with a bit of experimentation. If you would prefer to avoid oats altogether, please refer to my baking tips page where I break gluten free flours down by protein ‘weight’. Oat is a medium, and can be subbed with any of those other medium gf flours! Hopefully that helps marna, let me know if you need more info! Did you meant millet or millet flour? I’m guessing cooked millet if you meant millet (not flour)? Can’t wait to try these! oops..millet flour, thank you for catching that! and now you can test them Jessica and be my recipe tester too! I do not have guar gum. Can xanthum gum (sp.) be used? of course Charlotte, they are always interchangeable (xanthumn is derived from corn so we avoid it), thanks for your question! Sweet words gabby, thank you!